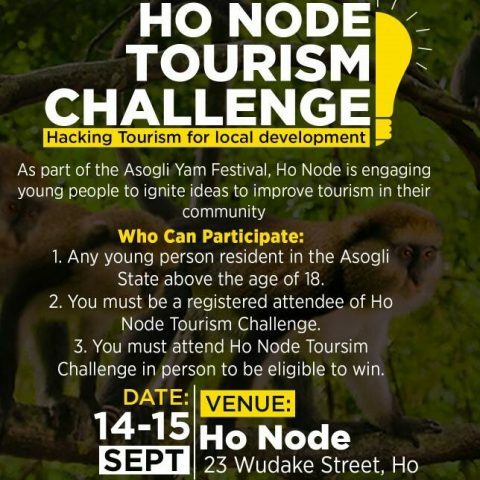 In the spirit of the 2017 Yam festival celebrations of the Asogli state, Ho Node, a digital innovation hub in partnership with Global Shapers Ho and Daily Guide Newspaper, is organizing an idea pitch competition dubbed HO NODE TOURISM CHALLENGE on the 14th and 15th (Thursday and Friday) of September 2017 at the premises of the Hub. Festivals have cultural, spiritual and socio-economic relevance in most communities in Ghana and are major rallying tool that brings citizens both near and far, Industry and tourists together once a year. However, rarely is the youth engaged in meaningful ways in the list of events during most festivals aside the fun fairs. Also, most communities have not fully discovered the tourism potential of their local festivals. At Ho Node, we are leveraging on the unique opportunities festivals across the country offer, to inspire and engage young people to come up with local solutions to local challenges/opportunities in their community. The Ho Node tourism challenge is a competition that seeks to empower the youth in local communities to innovate and develop solutions to the challenges affecting the growth of local tourism during their festivals. The Ho Tourism Challenge is the maiden edition of the tourism hackathon series, which would be held across the entire country during major festivals. It is a 2-day event that will gather creative, coders, tinkerers, social entrepreneur, makers, and resource persons drawn from academia, hospitality industry and industry regulators. Tourism experts will educate participants on the value chain of the tourism industry and the challenges faced in value delivery. Selected mentors will take participants through design thinking method for problem framing and ideation as well as pitch trainings. Participants would form teams, develop their ideas to the challenge questions and pitch to a panel of judges who will select 3 winners for a prize. We believe brilliant ideas that would be churned out during this competition will either be adopted by players in the local tourism industry or incubated into startups that will have the potential of providing jobs in the future. The Asogli state boasts of several tourist attractions, a serene environment and world-class hotels. The flora and fauna in Ho makes its an ideal desitnation for weekend get-away, vacation and relaxation destination in Ghana. The tourism and hospitality potential remain largely untapped and well-promoted natiaonally and globally. We believe the Ho Tourism Challenge will engage young people to understand the value chain of tourism, ignite new ideas to the challenges and opportunities in the sector to increase inflow of local and international visitors. This would lead to increased reveneue for value chain operators, more jobs created for the local youth and largely a general boost in the local economy. Interested participant in the hackathon should register online here http://bit.ly/2iUb58t , and be available during the 2-day event to be eligible for the winning prize. The event is being held with support from the Ghana Tourism Authority (Volta Region), Association of Ghana Industries (Volta and Eastern Region chapter), Citifmonline, Global FM, Voltaonline, V1TV, Daily Guide Newspaper, Dartey Media, TechTodayGH, watsuptek and other media supporters.